Today I wanted to cover a subject that I have not discussed at all in the past: Smart Pricing for Google Adsense. So, what is “smart pricing”? Essentially, you know when this has occurred if the amount you are paid per click is suddenly and drastically reduced in your Google Adsense account. So, if you have been making an average of $0.75 per click for a long time, and then you suddenly start making only $0.05 a click for an extended period, your Adsense account may have been smart priced. I want to discuss in detail why this happens and how to avoid smart pricing on your niche websites. In order to fully understand what “smart pricing” is, you need to understand the advertisers point of view. The ads being displayed on your site via Google Adsense come from individual advertisers bidding on relevant keywords. Google's primary income is derived from these advertisers so they are VERY concerned with the satisfaction of these advertisers. Therefore, if the clicks that these advertisers get from your site are NOT CONVERTING into sales on their website, they will stop advertising. If they stop advertising, Google loses money. Rather than take my word for it, I suggest you read up on what Google has to say on the subject. 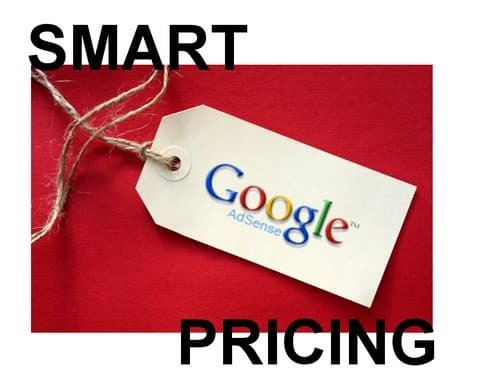 Read here for a perspective from the Google Adwords site: What is Smart Pricing? Read here from a perspective from the Google Adsense side: The Facts About Smart Pricing and here: About Smart Pricing. So, there is often a lot of rumors, mystery, and anger in the internet marketing forums and community surrounding smart pricing, but in a nutshell if you have targeted, relevant, and quality websites – you probably don't have much to worry about. I am going to discuss in detail how to avoid smart pricing. In addition, if your account has been smart priced, it can be reversed! Just follow the guidelines below. Overall, I have been using Google Adsense for about 7 years now, and I have never been smart priced for an extended period that I am aware of. I have seen drops in bids from time to time, but I think this is more of a reflection of actual advertiser bid amounts. Overall, my guess is that its not an extremely common occurrence; however, the following steps should help keep your CPC (cost per click) as high as possible in your Adsense account. Essentially, the primary reason that Google will reduce the amount you get paid per click is that the ads on your site are not producing results for advertisers. This is stated very clearly in the 3 articles I linked to above from both Google Adsense and Google Adwords. Obviously, how effective the advertiser is at writing ads, how optimized their landing pages are, and other factors out of your control will effect conversion rates. However, Google will not penalize you for poorly written ads or other things that you can't control. They have huge amounts of data and are surely comparing how your site performs against how other Google Adsense sites are performing with the same advertisements. If your site is performing much worse than comparable Adsense sites, then you are likely to get smart priced. and to a degree – How relevant your ads are. Natural search engine traffic converts best! I have always built my sites so that they rank well in the search engines and this is ALWAYS my primary source of traffic. However, if you are driving traffic to your site using other means like forums, emails, blog comments, or other methods, its very likely that your visitors will be less targeted. Visitors that just happen upon your site are less likely to convert than visitors that actively search and find your site based on relevant content. Here is another article that talks about the importance of search engine traffic in relation to smart pricing. If you are like me and build sites that target specific keywords and rank in Google for those keywords, then you are probably already getting traffic from the search engines and likely have little to worry about. This is why keyword research is both the most important and most difficult part of building niche websites. If you are getting traffic from multiple sources, you may want to consider only showing Adsense ads to visitors coming from Search Engines. I have personally never done this, but through my research I found out there are a few different WordPress plugins that allow you to only show ads to search engine traffic. I haven't used any, so I can't provide an honest review of any, but you can start your research right here on a few of them. Sure relevant and targeted content seems obvious, but some sites struggle with this. I have always taught that for niche sites, you need to be very strict in your keyword choice and target ONE specific keyword primarily on your site. Yes, you can and should also target secondary keywords – but these are also targeted. Picking a specific keyword that you have researched allows you to then created relevant content. Not only will relevant and targeted content related to a specific keyword make you rank better in the search engines; it will also ensure that you don't get smart priced on Google Adsense. For example, someone's random personal blog that rambles about their day to day life where they happen to mention the keyword “blendtec blender review” in the middle of their discussion about making smoothies with their Uncle Billy is MUCH LESS LIKELY to convert a visitor into a sale than a niche site targeting “blendtec blender review” with researched and targeted articles. So, the random blog might get the same adsense ad about “blendtec blenders” as the niche site – but the niche site is MUCH more likely to get visitors that are primed and ready to click on the ad and then actually buy the blender. Does Click Through Rate Affect Smart Pricing? Google specifically mentions that CTR (click through rate) does not affect smart pricing decisions. However, Court Tuttle specifically mentions that increasing his CTR (by removing adsense from low CTR sites) reversed the smart pricing on his account. So, which is true? Well, both articles are actually a few years old, so the articles I linked to directly from Google earlier are likely the best source of information. Its important to know that advertisers actually are rewarded by Google (with higher Quality Scores) when they have ads that get clicked more (higher CTRs). So, optimizing the ad placement on your site (without overdoing the above the fold ads) is actually a good thing from both advertisers perspective and Google's pocket book. So, while I think improving CTR is a good thing, I don't think it has much to do with smart pricing. Its likely that Court Tuttle happened to remove the adsense ads from his poor converting sites (which just happened to also be his low CTR sites) and therefore reversed the smart pricing. No, you can't control the ads placed on your site directly. However, you can change how targeted and how good the content is on your site. So, by doing a few simple things like using buying keywords/targeted keywords in the title of your articles and using relevant keywords throughout your articles; you are more likely to get the ads that are the most targeted on your site. Without using the keywords properly on your site, you are much less likely to get the relevant ads that produce results on your sites. However, there is another step to make sure you are getting the most relevant ads on your site. You can use the Allow & Block Ads option within the Adsense account. I would recommend leaving these in their default settings UNLESS you are certain that you have been smart priced. At that point, I would recommend experimenting with some of these options to try and get your click values back up. 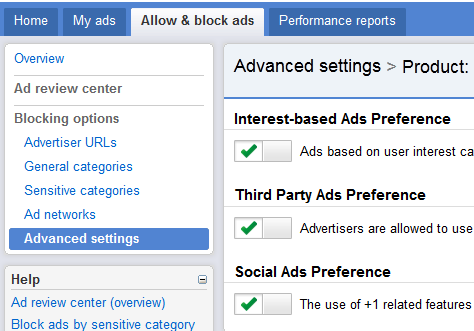 You can turn off Interest-based Ads Preference, Third Party Ads Preference, and Social Ads Preference under the Advanced settings. Google Adsense is highly complex and this would take an entire post of its own to do these settings any kind of justice; but essentially these allow you to control the types of ads and the source of those ads that are shown on your site. You can get even more specific by blocking entire categories of ads as well. Before you start turning off all the categories that don't fit with your website though, you have to consider that Google has a complex formula built in that shows re-targeted ads to users who may have been searching for something other than what is on your site in the past. So, Google might shows ads related to “BBQ grills” to a visitor who recently searched for BBQ grills even though they are on your site that is about “remote control helicopters”. Google's re-targeting formula has calculated that this visitor is likely to click on ads related to “BBQ Grills” due to their past searches. So, its not an easy decision to determine which categories or ads to turn off. This is why I highly recommend leaving the defaults in place unless you are 100% certain you have been smart priced. And even then, I would only change any settings after you have optimized your sites based on recommendations given above. Will Removing Adsense Ads Help? Another option you can try to reverse the smart pricing on your Adsense account is by removing ads from poor performing websites. Of course, its impossible to know which of your sites is performing poorly as far as advertiser's conversion is concerned, but you can certainly test. If you only have a few sites, I would recommend removing adsense from one of your sites and leaving it on your other sites and see what happens. By testing sites one at a time by removing Adsense, you may be able to isolate which site is the under-performer. As mentioned above, some have claimed that removing Adsense ads from low CTR sites has reversed the Google smart pricing effect; however, its much more likely that these also happened to be the low converting sites for the Adsense advertisers. Overall, Smart Pricing is so much less likely to occur if you are doing proper keyword research, building relevant content, and deriving most of your traffic from the search engines. I have never had to deal with any severe penalties with smart pricing and I don't believe that it is an extremely common occurrence for those getting most of their traffic from the search engines. However, if your Google Adsense account ever is effected by Smart Pricing, I hope that these guidelines above will be useful. Do you have any experience with smart pricing? Do you have any comments to add? Overall, please leave your thoughts below as I'd love to continue discussing the subject and hearing from your experience as well. Can’t say I’ve ever experienced smart pricing but it doesn’t sound like much fun. 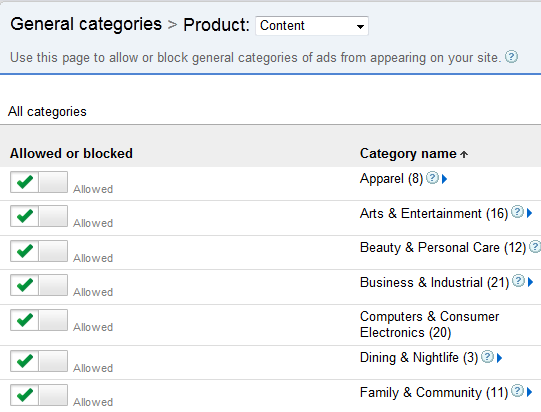 Quality traffic has never been an issue for me, although I did not realize you could block categories of advertising. Off to test that out! Yep, I think smart pricing is not an issue for most people – but its something to be aware of. Thanks for the comment Thomas! Glad I could help out! Interesting I didn’t think of this before. But these might be the factors for deciding the bids but there are certainly many other as well. like interest based advertising which may reduce or increase your CPC dramatically and which can not be controlled by targeting keywords or content on page. I actually mentioned interest based ads and even included a screenshot of how to adjust this in your adsense account. Do you turn on or off interest based ads? You may have mentioned it somewhere..
My take is to test. One time I got $10 click, but still don’t know if it’s related to the “interest” based one turning on. For me, I feel it’s kind of “spy” that Google follows me and show me “interested based” ads everywhere I go. 🙂 For example, I was researching a toy for my kids, when I go to other sites not related, Adsense keeps showing toys. I have usually left interest based ads on. From my testing, my numbers are better when I turn it off. I have also heard other people say that they leave it on and do fine. I guess you just have to experiment and do some testing. I would give it some time. Likely it is due to the change in advertiser bids. Also be sure to look at the average CPC for your entire account for an extended period of time (say for a month). So compare what your average cpc for last month to your avg. cpc for this month. I wouldn’t jump to any conclusions until you give it some time. I learned that some of my keywords CPC is seasonal. They are paid highly in some months. For those advertisers, they also have their pattern and budget allocated through the year. are smart pricing applied only for a certain time or can effect our account forever? If you fix this issues, the smart pricing can be lifted. Its not forever. Sorry if im being slow today. Is smart pricing going to effect an entire adsense account if there is a badly performing site in that account or just that single site? Thanks. Thats a really bad thing. It could explain a few issues ive seen. thanks again for thought provoking content on your blog. No wonder I got penny clicks sometimes. 😉 Do you know if smart-pricing resets on monthly or regular basis? I have no idea how long it would take to reset. I assume whenever the conversion increase for the advertiser then it would reset. I think much of the talk about smart pricing is rumours but I’m sure all of have some old sites we have neglected with adsense on. Can’t hurt to clean them up and even take adsense off if it means improving CTR on our main sites. I agree that alot of talk is all rumors – I think smart pricing is pretty rare. I do have one question, though. Are you saying that if one website is performing poorly, it will have an effect on every single site that is connected to your Adsense account or just on that one site in particular? I always thought that if one site was smart priced due to poor conversions or other factors, it would only be for that one site only. If other sites were pulling in higher CPC amounts AND delivering results for the advertisers, Google would want to keep those prices elevated to continue to generate a higher revenue for them. If they smart price an entire Adsense account that is full of websites that perform well and a couple that don’t, that would almost seem like it would dramatically decrease their overall revenue potential. Bryan – you make a great point. Since this has never occurred to me, I don’t know for sure. From what I had read from other people that had been smart priced, it did effect their entire account. But its very likely that Google would do just what you stated – keep the high paying ads running and smart price the low converting ads. That would make a lot of sense. Anyone know this for sure?? I am not sure.. As a test, I may try to throw in some bad ones and get myself smart-priced, to see what happens. 😉 I’m just kidding. I read about this before.. on some ebooks I forgot. It would impact your own account. What Bryan said.. also makes senes to me. Google wanna be profitable too. They should let your high converted one running as is. I am assuming we’ve been smart priced and I think its because one of our sites is a high traffic forum that runs adsense. It suddenly dropped from $.75 clicks to $.15 clicks and other sites in the account dropped at the same time. I am trying to get approved for a second adsense account thru one of our companies so that we can move that forum into its own account. All of the other sites are highly targeted sites with very nice, unique content. Chris – okay this experience seems to underscore that smart pricing can indeed effect an entire account (not just the poor performing site). This sounds similar to what I have read elsewhere. Does this mean that Smart Pricing affects all sites at my Adsense account? I have some websites with very low click cost (“Smart pricing” perhaps), and some sites with bad CTR. I’ll try to remove ads from poor CTR sites to find out how it will affect the low price websites. See comments about whether or not the entire account is affected – appears to be yes. Smart pricing seems like a smart way for Google to protect their advertisers but i doubt it occurs such frequently. It shouldn’t at all be a problem if you have highly targeted niche sites with lots of traffic from the search engines. This is not hard to understand why if you consider that search engine users are usually actively searching for information about the topic and are thus very likely to click a relevant ad once on your blog or site. I noticed that you didn’t really touch on the ability to target adsense channels (and domains) – do you use targeting, and if so, do you think that using the option to target certain channels and domains might help keep a domain from being smart priced? I do use URL channels primarily – but I do use other channels as well to track different ad placement on some of my higher earning sites. Sure, I think that this could be another tool you could use to even target more precisely. Great post! I think I might have wasted a few bucks on a domain then. What do you think? Without giving away the niche, say I have an exact match domain with 8000 exact searches a month on “BigAlswebsite” (totally made up…but Big Al is a popular business). I write a bunch of posts on the products Big Al sells. Do you think Smart Pricing would affect this site? Or any banner advertising for that matter? Well, it could be okay. I mean if you are still getting the majority of your traffic from search engines – people are landing on specific product pages I would assume. You are likely still okay. Thanks for sharing Kevin! This does indeed sound like a perfect example of smart pricing and why Google would do it. Untargeted traffic and not buying traffic. Yes, if a site deserved to have smart pricing applied, it was without a doubt that site. If I was an advertiser I wouldn’t want to be paying for the types of clicks that site was generating. For targeted search engine generated traffic, smart pricing is not something I would even worry about. Thanks again for the detailed post! That’s a really good post. Just 2 days ago I actually saw my adsense clicks change after I refreshed my stats. I thought adsense was shaving clicks like in cpa. lol, I posted on WF to see if anyone had this happen to them too. Then you posted this on your blog which explains everything. I never heard of about Smart pricing prior. Importantly how to fix it which I’ll be revising my sites now. I do my best to read all the minds I can! Great post Spencer. Ironically today I have been hit by smart pricing on one of my accounts. C’est la vie. I think your follow Trent? Hey Matt, what % drop did you notice? That’s amazing that I was just thinking about “smart pricing” today, and wondering if I had been smart priced ever. Don’t know that I have — I hope not — but I have definitely blocked categories on “get rich quick” schemes and stuff. I remember my ad revenue dropped after that, but I seriously didn’t want to lead my readers to scams. I find that one of my niche sites is cool where I’ve opted into image ads only, and even if it doesn’t get a lot of clicks, when it does get a click, those ads seem to pay well. My philosophy is that since it takes Google so long to approve display ads, those are the type of advertisers who are in it for the long haul, unlike the text ads that can go up sooner. Interesting theory about image ads! It certainly does take longer for advertisers to get approved with these. I have actually done the opposite sometimes – I opt for text ads only, I find that I get more clicks this way on some sites (not all)…I might have to reconsider. What’s better: more clicks or less clicks that are higher paying? I have a question, how does Google will know that which sites are not converting into sales? Do they track the sales generating from a click as well? At the same time, I took tip from your this post and blocked some sub categories. Those ads were not relevant to my niche. Yes. In google adwords, advertisers can set up conversion goals. This would be the information that Google uses…so its tracked directly through adwords. Thanks – I’ve been smart priced (3 clicks for 8 cents yesterday), now at least I know I’ve been smart priced and I’ve made adjustments – like taking adsense off my blog and adjusting the categories for my niche site which will still use adsense going forward. If its only been a day of low clicks, I would give it some time. Its very possible that advertisers were just not bidding much yesterday. Thanks, I’ve not heard of this before. One thing some of my IM friends have suggested I experiment with to increase CPC is advertiser sculpting – finding out which advertisers are paying very low CPC’s on your sites and then blocking that advertiser from your adsense account. I haven’t really heard much about this except for from these few friends, so I’m not sure if it’s a good idea, but I might give it a shot – they seem adamant that it increases earnings on a site. Its a great idea! However, it can be difficult to implement and very time consuming which is why I personally have never done it with my 200+ sites. However, if you only have 1 or 2 sites this might be very feasible. The ad sculpting sounds a waste of your time when you could be creating more new content. Thing is, if google is placing those ads it will just surely replace them with another low-paying advertiser, no? Maybe you are just in a low paying niche otherwise google would place better ads which is in their interest too? I really can’t say, because I haven’t tried it, but some dudes who I know that make a tonne of money and are very experienced internet marketers say it works so I’m definitely not gonna knock it before trying it. Thanks for the post, it’s very useful data. Incidentally, there has been quite a fuss today kicking off on Google+. Basically Jef Poskanzer had his Ad Sense account terminated for no given reason and then was refused the right to appeal it. He posted about it at: http://acme.com/updates/archive/173.html. This caused one of the former Googler and creator od the AdSense API, Nelson Minar to officially turn his back on Google. Trying to rescue the situation, Matt Cutts has weighed in and aired the whole thing publicly. to your knowledge,has anyone else had their Ad Sense accounts terminated with no reason given, even if they weren’t doing anything bad? Wow — that’s a trip. I read the blog post and his appeal. I hope he’s able to perhaps set up another Adsense account under his business name, if he has one, since Google allows one additional site under your business — like an LLC, for example — outside of your person Adsense account. But they probably won’t let him load the ads on that same acme.com site any time soon. Google did shut down one of my Adsense accounts long ago, but I was doing something wrong and they did pay me most of the money they own me, so it was a win-win situation. I hope that guy can move on. Another lesson for varying our income sources. Wow, just read the blog post. Where can I follow the updates on Google+? I might have to do some digging. VERY interesting. I’d like to see if this changes how Google Adsense operates at all. I have heard rumors of others getting their adsense accounts closed, but I don’t know anyone personally and can’t confirm any of the instances that I heard of. Great post Spencer, I am one of those who had no idea about Smart Pricing (although Walmart’s sister company here has a budget range called ‘Smart Price’!). Just to clarify, smart pricing will affect your whole Adsense account, not just one or two sites? In my experience, Smart Pricing happens when the overall monthly CTR drops to under 4% for a period of time, roughly 3 months. @HCT, My AdSense account has periods when it drops and then bounces back up, so yeah it’s not permanent. My advice (for what it’s worth) is make sure you assign channels to each website in AdSense so you can track the CTR of each site and if it doesn’t make a big difference to your income, remove AdSense from any site with a low CTR. Do as many of them as you can easily afford and keep an eye on your overall CTR. Also it’s worth testing different page designs and layouts (or themes if you’re using WordPress) – just changing a page layout can have a very quick impact on your CTR. Be careful about putting too many ads above the fold or you’ll fall foul of Google’s recent algo change that’s penalizing sites with not much content above the fold. And do everything else Spenser says. Great tips Nick.. I feel we all follow Spencer and learn various stuff from each other. Cool! Great tips Nick! Thanks for sharing. Spencer, thanks for all your great tips. I was reading something about Smart pricing before and didn’t get it all. What you told us truely clear my cloud. For niche site bloggers, I’d say writing related content is the key.. I am learning and trying out different style and see what will convert better or not. High CTR is related to your content (assuming you have a killing layout and color blend). Your content answers some questions.. and the visitors wanna find out more by clicking your Ads going to the advertisers. I love product niche too.. as visitors love good deals and discounts and many times Ads is “attractive” and I wanna click myself too! Very nice post Spencer. Smart Pricing is one thing that I have never even heard about before. I recently came across your blog and it has become one of my favorite places to find good honest information. Keep up that great work! I think it may relate that I am using ads above the fold..
Didn’t know much about smart pricing but I will surly pay more attention now to my account. Thanks for another great and informative post. 1) Don’t get too much traffic from google image. My site has lots of traffic from google image, but those traffic don’t convert. That’s because I have one image on each of my webpage, and most of my image show up on the first page of related keyword google image search. If you have the same situation, try delete those images from your website. 2) Be careful when you do mass article submission to build backlinks. I used to do that and with one click, my article will be submited to 1000s of low PR and low quality article directories. I did get tons of traffic from those article directories, but those traffic don’t convert I guess. Thanks Spencer for this informative post. So what’s the deal with Adsense CTR? As Nick put it it should be above 4% and I have read somewhere that if it’s constantly above 6% Google will sooner or later do a manual review of your sites. Now, everyone knows that CTR can be pumped up hugely by using above the fold techniques (which are dying out because of the new algorithm) – in this case what do guys think is the best CTR? I have sites that average at around 10% or even more. Can it be “too much”? I’ll give it a try! I hope to increase my income! thanks for the information, but it does not violate google TOS right? Spencer does the smartpricing happens to all your site on your adsense account or just by a few? I have a site that is having some really low clicks that i would like to fix it. I understand it happens to all the sites on your account. I think I might have be experiencing smart pricing right now. My site has gotten penny clicks the last two days. Could it be because I have a low CTR (I’m hovering just above 2% for the month and was at 1% last month)? Also, I’m getting ready to launch my second Adsense site – will it too fall under smart pricing even though it is not live with ads yet? I was having decent CPC until recently. Now, reading this your article I know where the low CPC is coming from. I have been driving massive facebook traffic to my site recently. Now that I know, I have stopped my facebook campaign but even after 1 week I have not seen any improvement. Today I hv removed adsense from all my sites and hv resolved to leave it that way for at least 3 weeks. That means loss of income but do you think it will ultimately reverse the ultra low cpc? I have only one website, do you think I have taken the right decision? Interesting and informative article. My blog is effected by smart price in July and I have a dramatic decrease in my earning. I removed Adsense ads and know trying some alternatives. I do hear people mentioning that smart pricing will affect the entire account and not just one or two non converting sites. I’m not disputing that. However, it still doesn’t make sense to me if that Google penalizing the whole account. And what is the definition of non converting sites to be removed from the account to reverse smart pricing? low traffic? that is not really accurate isn’t it as a 30 odd visitors a day can still convert better that a 100 add visitors site. My account has been smart priced for sure, because I get 5 cents per click. It’s very frustrating because I can not block some categories on my account. I also agree that removing your ads from low performing site will reverse the smart pricing. Thank you for your suggestion. Really, it was very helpful for me. You can’t compete with Google ideas!! Very helpful post.. thanks for sharing.